When you have a plumbing problem at home, whether it’s a leaky pipe or a blocked drain, it’s always in your best interests to have it fixed immediately. Why? It’s not just your access to clean water that will be affected, but also your health and your home’s structural integrity. Dirty water can quickly accumulate and release foul odours and cause diseases; your walls and floors can get soaked and cracked because of burst pipes; and your electrical systems might be compromised due to various leaks. These are just a few of the stressful consequences of a home plumbing issue. To help mitigate the damage and restore your home plumbing system into good working order, it’s best to contact your local plumber immediately. They will know how to best approach the situation because they are more familiar with your community, and therefore they can deliver quicker and more efficient services. Hiring local plumbers will also make you feel more comfortable letting them work inside your home. Since they are from the same or a similar community, you will find that it is easier to develop a rapport with them. Building a relationship with service providers like electricians and plumbers will give you more peace of mind because you trust them and their quality of work. Plus, you can rely on them that they will be able to attend to your home plumbing problems no matter the time you call. What’s more, a local plumber will also be able to give the most competitive prices that won’t make a huge dent in your budget. They’re more familiar with the rates of plumbing services where you live, so they will be able to provide you a more accurate cost estimate. And because they don’t have to travel so far, they will not spend as much on their logistical expenses and will therefore be able to offer you even lower rates compared to those from other, farther locations. 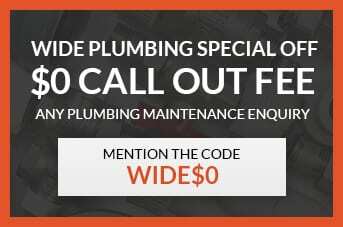 If you live in a Central Coast suburb and you need the help of a local plumber to help fix your home plumbing problems, don’t hesitate to call on Wide Plumbing Services to give you the cost-effective and long-lasting solutions. We’ll make sure that we will get the job done right and done good! Just give us a call at (614) 392 7731 or send an email at wideplumbing@info.com for any enquiries or if you want to avail of our wide range of home plumbing services. Depending on the amount of work that needs to be done to resolve the problem, a local plumber can charge anywhere from to . Per hour rates can vary as well, ranging from to . If you have multiple home plumbing woes, your local plumber may offer you a flat rate instead of charging per hour or per job. This is generally friendlier to your wallet, especially if the damage is more severe than expected. And of course, you can expect emergency plumbing services to be a bit more expensive than the standard rates. It’s best to be observant so that you don’t rack up a huge plumbing services bill. Take note of the warning signs of broken or leaking pipes, or a damaged water heating system and immediately call your plumber to have these home plumbing problems fixed. You should also address “small” problems before they become bigger problems. Things like leaking faucets or blocked drains can quickly catch up on you and cause more trouble and costly repairs or replacements. Wide Plumbing Services is one of the most trusted local plumbers for home plumbing in the Central Coast. We not only have a wide range of services and charge fair prices, we also have a team of highly trained and certified plumbers who are guaranteed to deliver top-quality results on time, each and every time. Wide Plumbing also guarantees that whatever services we render will last for at least a year — we don’t want your hard-earned money to go to waste! We can also visit your home, assess the situation, and offer a no-obligations estimate so that you can plan your budget accordingly. We also put as much importance to your home as you do. Rest assured that we will consult you first before we perform any additional works, and that we will leave your home in excellent condition once we render the home plumbing services you need.